If you’ve played Hothead Games’ Kard Combat (Free), it’s a safe bet that Three Donkeys’ Spectromancer ($1.99) is going to seem familiar. Very familiar. It’s not just that they’re both card-battle games in the same vein as Magic, it’s that they have exactly the same rules, play the same way, and while the cards have different names and art, their game stats and abilities are identical. So is Spectromancer a clone of Kard Combat? Well, no. Then Kard Combat is a clone of Spectromancer? No, not really. The thing is is that Kard Combat is a licensed port of Spectromancer – the computer game that’s been out for years. 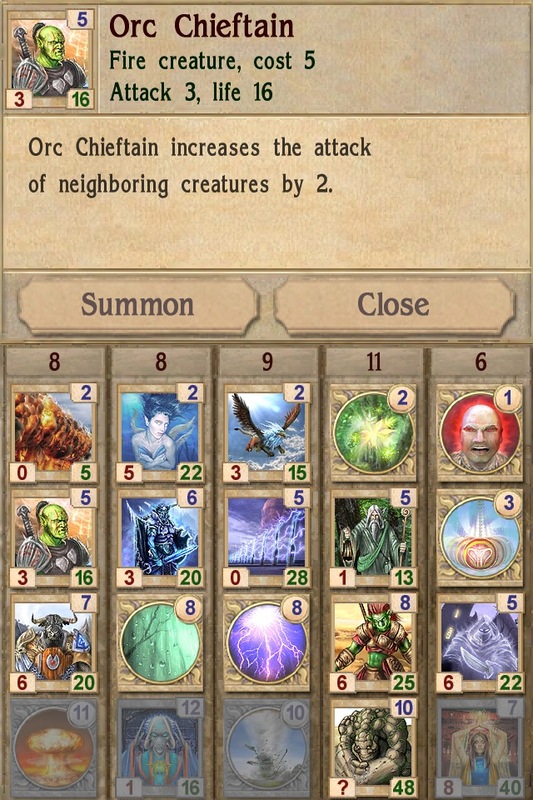 The new Spectromancer iOS game is also a port, but it’s a direct port, keeping the title, card names, art and style of the computer game (which, apparently now exists in a free Flash version as well). 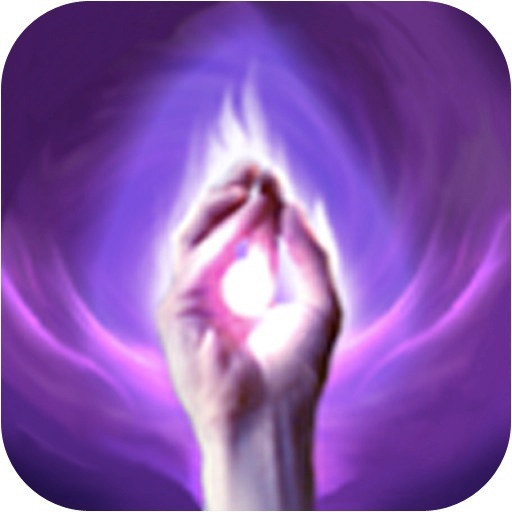 The crisis of origins doesn’t stop there: Spectromancer is based on Apus Software’s Astral Tournament (2001) a game heavily inspired by, you guessed it, Magic: the Gathering. Spectromancer is a joint project by Alexi Stankevich, the creator of Astral Tournament, and Richard Garfield himself (y’know, the guy who created Magic). In short, Spectromancer is it’s own Grandpa. None of that changes the fact that it’s a good game, designed to capture the intensity of the wizard’s duel without all of that card management and deck building. 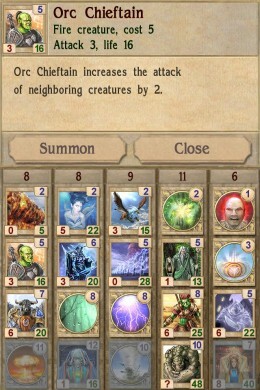 If you want those mechanics, you’re better off with Magic 2013 (Free) or Summoner Wars (Free). After all, Kard Combat garnered a number of awards when it came out last year, and we liked it well enough ourselves. The question is, what’s to choose between them? The answer, I’m afraid, is easy: Kard Combat never got all of the cards available in Spectromancer, and it seems that it’s not being supported any more. This has to be a bitter moment for players who paid $10 for the “full unlock" of that game. Spectromancer is not Universal, but it has a fairly good excuse: the design of the iPhone and iPad versions are very different in order to best cram the entire play area onto the mobile screen without needing to scroll. 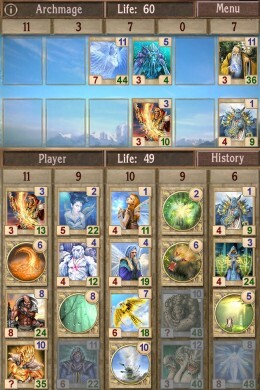 (Kard Kombat scrolled on iPhone and iPod touch, but was designed so you rarely needed to scroll the play area.) Overall the interface on Spectromancer is an impovement in functionality, at a price in style. Kard Kombat has a consistent, dark and creepy look, while Spectromancer is very much generic high fantasy. There’s are two places where Spectromancer really stands out: the single-player campaign and the pool of players for versus play. 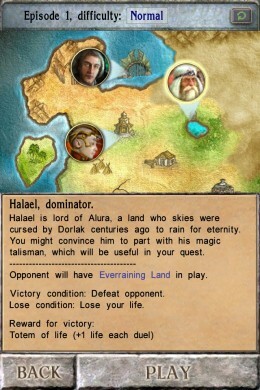 Kard Combat only has a vertical “tournament" style campaign called “the Tower," whereas Spectromancer has a full-fledged campaign with multiple maps, choices between battles, options for different permanent bonuses, and something vaguely resembling a story. That’s probably not enough to draw invested players away from Kard Combat, but the fact that Spectromancer’s multiplayer links up “fresh meat" iOS gamers with an existing community of PC-based players just might do it. 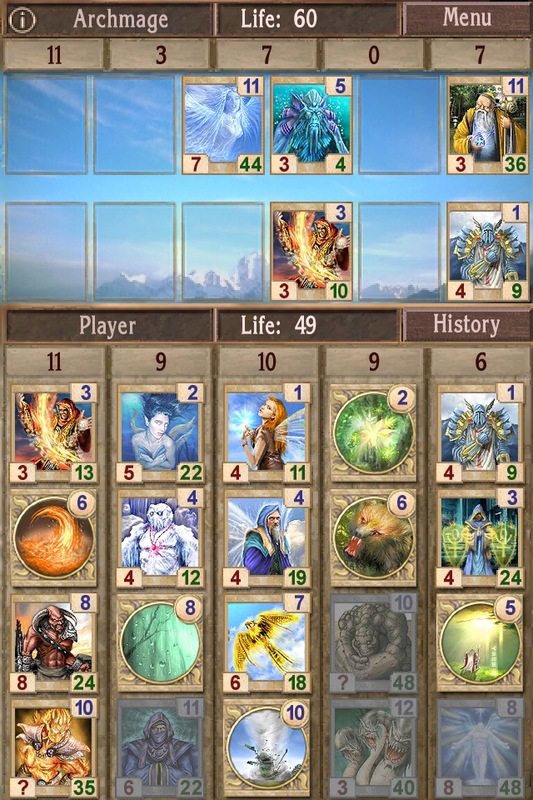 In the end, I’ll be sad to see Kard Combat go – I like the look and feel of that port better than the “real thing" (summoning a Nephilim is way cooler than summoning a Troll), but the sacrifice had to be made in order to integrate the multiplayer pools. Maybe the Hothead team will link up with Three Donkeys for a sequel. For now, if your’re a fan of Kard Combat or the PC version of Spectromancer, the iOS version will do everything you want it to.